Take a glance at our label and you’ll see that Moose Maple Butter is not weighed down by a long or fussy ingredients deck. 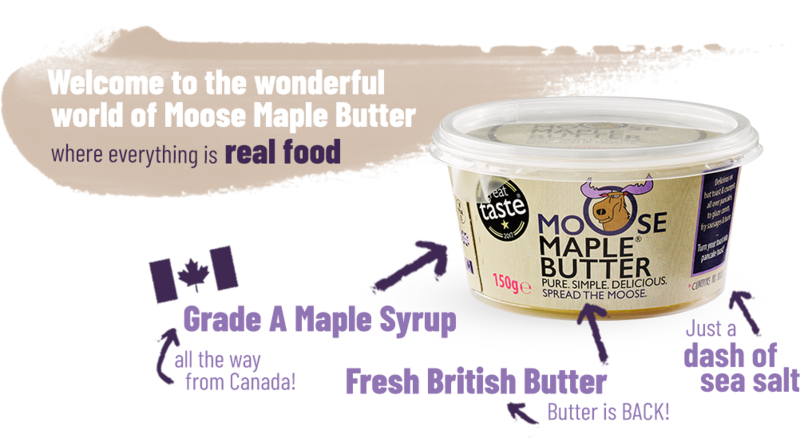 We think it’s the quality, not the number of ingredients, that makes Moose Maple butter so special - which is why we really focus on the provenance of our ingredients, choosing only the very best. Our unwavering belief that ‘butter is back’ sits at the very heart of our story. Thankfully, natural and clean eating is very much back in vogue thanks to consumers realising that not all fats are bad. The elimination of ‘good fat’ (well-intentioned though it might have been) has too often led to the unwelcome substitution of quick-fix sugars and inappropriate carbohydrates. Better than that; top drawer British butter is brimming with vitamins A, D, E & K & selenium. Quite literally the last word in top-notch tree sap! A maple tree doesn’t give up its special syrup easily. It takes 40 years before a tree is ready to tap and even then each tree only yields a miserly 35-45 litres a season. This all-natural source of energy and good nutrition has anti-oxidant levels that would draw admiring glances from a banana or a generous portion of broccoli; a lower glycemic index than cane sugar and a significant smattering of manganese, potassium, calcium, zinc, manganese and riboflavin. Just a dash, but more than enough to ensure every ingredient is at the top of its game. When you’re an old-school jam, curd, marmalade or chocolate spread waiting patiently to be spotted on some often overlooked supermarket aisle, it’s maybe not surprising that you might consider the odd ‘artificial extra’ to help extend your shelf life. It’s not for us to talk about xantham gum, gelling agents or artificial flavourings and colourings, (PLEASE don’t get us started on palm oil and refined sugars) but our general rule of thumb is that if it’s made in a lab and not in the countryside, forest or sea we’re simply not eating it! Thankfully you won’t find us hidden away on some faraway ambient food shelf. We choose instead to make our stand in the very thick of the chiller cabinet, where a growing number of the freshest, most flavoursome and nutritionally well-rounded foods & drinks hang out.